If you have more than one account in Google, you usually logout the currently used account and login again the second account. This could be time consuming specially if you check on your emails regularly. 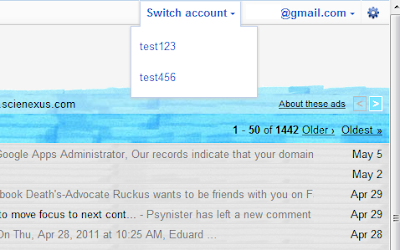 To make your life easier, Account Switcher for Google Gmail extension was created. To start using the extension, add the different accounts you use from the extension's options. The information you enter are stored in the browser only. 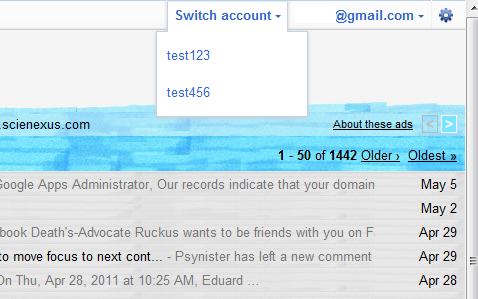 Once the extension is installed, a "Switch account" option will be displayed on your GMail Top bar. When you click the Switch account button, a drop down lists of accounts you have saved are shown. Choose any account from the list you want to sign in and you'll be signed out of the current account. If you didn't save the password for the selected account, you'll be forwarded to the login page.